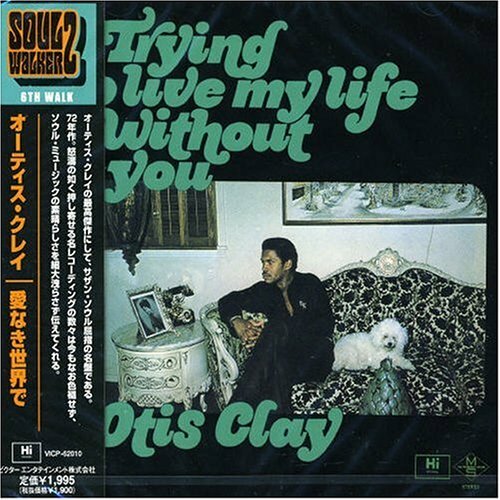 OTIS CLAY-TRYING TO LIVE MY LIFE WITHOUT YOU. Recently, I was listening to a compilation of Stax Records music, 3000 Volts of Stax, and came across a track by Otis Clay called Come To Me. This set me thinking about how great a soul singer Otis Clay was. I have long been a fan of music, and own a number of his albums. Having finished listening to this album, I decided to re-visit Clay’s music, something I do often, and always enjoy. This made me think that maybe I should write an article on Clay, and his music. Previously, I have written about other artists who recorded on the Hi Records label, and these articles on Al Green and OV Wright have been popular. Therefore, I hope that this article on Otis Clay and his album Trying To Live My Life Without You will also be popular, and maybe people will be encouraged to find out more about Otis Clay and his wonderful music. Otis Clay was born in 1942, in a small rural town Waxhaw, Mississippi. He was brought up in a deeply religious family, and made to attend church every Sunday. Many members of Clay’s family were singers, and during his childhood, there was always a lot of singing taking place in the Clay household. The Clay home was often used for rehearsals, and the young Otis Clay used to sit and watch these rehearsals take place. That was his first musical influence. After the rehearsals were finished, Clay used to imitate the singers that he had watched practice. This led to him starting to sing gospel music. When Otis Clay was eleven, his family moved to Muncie, Indiana. Then, a year later, Clay started singing professionally with a gospel group the Voices off Hope. During the next few years, Clay moved from one gospel group to another. However, in 1957 he joined the Golden Jubilaires, and moved to Chicago. Then, in 1959, Clay joined the Famous Blue Jay Singers. It was during his time touring with them, that he learned old-fashioned jubilee singing. Thereafter, Clay spend most of his time singing with various gospel group. In 1962, Clay made what would be his unofficial recording debut. Clay recorded four tracks for Columbia Records. These tracks were produced by Carl Davis. However, none of the songs were ever released. If these R&B tracks had been released on Columbia, Clay would have made the switch from gospel music to secular music much earlier than he did. It was not until 1964, that Clay made his official recording debut. He was the lead singer on The Gospel Songbirds’ recording Let Jesus Lead You on Nashboro Records. Interestingly, another member of the group was Maurice Dollison, who went on to record the song When You Wake Me Up under the pseudonym Cash McCall. Cash McCall, in 1965, was by then a session musician in Chicago, was partly responsible in convincing Clay to make the switch from gospel to secular singer. So, in 1965, Otis Clay eventually made the switch to secular music. He signed with George Leaner’s One-derful! Records, who were, at that time, the fastest growing record label in Chicago. McCall and also Harold Burrage became Clays‘ mentors. Sadly, Burrage died in 1966. Clay released scored his first single on One-derful! Records in 1967. The track was a gospel tinged song called That’s How It Is (When You’re In Love). The singles reached number thirty-four in the R&B charts. His follow-up single A Lasting Love reached number forty the R&B charts. These singles gave Clay a higher profile, and A Lasting Love gave him a nationwide hit single. By now Clay’s star was in the ascendency. However, problems were just round the corner for Clay and One-derful! Records. Disaster was to strike for Clay in 1968 when One-derful! Records collapsed. What should have been a huge stepping-stone in Clay’s career, turned out not to be the case. Otis Clay’s contract with One-derful! Records was purchased by Atlantic Records. They then set up a subsidiary company called Cotillion. The first record released on the new label was Clay’s cover version of The Sir Douglas Quintet track She’s A Mover. This reached number ninety-seven in the Hot 100. Later singles on the label failed have even the success She’s A Mover had. This was to include Hard Working Woman produced by Syl Johnson and Is It Over? produced by Willie Mitchell in Memphis. Mitchell was to have a further part to play in Clay’s career, at a later date. In 1971, Clay moved to the Hi Records label. This was to prove to be the making of Otis Clay. It was on Hi Records that Clay was to have his biggest hits, and record the best work of his career. In 1972 he recorded the album I am featuring in this article, Trying To Live My Life Without You. The title-track Trying To Live My Life Without You gave Clay the biggest hit of his career, a number twenty-four R&B hit in 1972. This song, was later to provide Bob Seger with a number five single in the pop charts. The follow up to Trying To Live My Life Without You, was If I Could Reach Out. Clay went on to record further singles on the Hi Records and in 1977 an album entitled I Can’t Take It. After leaving Hi Records, Clay recorded for the Elka, Rounder Bullseye Blues labels. He also recorded albums for his own label Echo. In 1998 Clay was reunited with Willie Mitchell. Mitchell produced Clay’s album This Time Around. Otis Clay still is popular, and recording and performing to this day. He has a large and loyal fanbase throughout Europe, Japan and the US. Now that I have told you a bit about Otis Clay’s life, I will now tell you about his album Trying To Live My Life Without You. The first track on the album is the title track Trying To Live My Life Without You. It is always difficult to decide what track to start an album with. Often, an artist or record company will choose one of the strongest tracks. This is what has happened here. Trying To Live My Life Without You is by far, one of the best tracks on the album. Clay has a lot to live up to, because OV Wright previously sang this song, and many people would argue, sang the definitive version of this song. However, Clay does well, singing this song with passion and feeling. His voice is perfectly suited to the song, and for me, he almost matches Wright’s performance of this song. On the next track, I Die A Little Each Day, Clay produces an emotional and exceptional performance, on this cover of Don Bryant song. This track is a slower song, and one can see Clay’s gospel roots and influence in the way he delivers the song. Clay’s vocal is ably assisted and complimented by the trio of backing singers, Rhodes, Chalmers and Rhodes. The next track, Holding On To A Dying Love, starts slowly, with Clay singing his vocal in front of the band. However, this track has a bigger sound, and as a result, Clay produces a louder and stronger vocal performance. Again, on this track, Clay is ably assisted by backing singers, Rhodes, Chalmers and Rhodes. This track is a good one, that Clay delivers well, singing it with feeling and emotion. On I Can’t Make It Alone, the track at the start has the unmistakable Hi Records sound. When you listen to this song, it is packed full of emotion and hurt, and Clay delivers the song as if he has felt and experienced, these emotions and hurt. This is a song written by Daryl Carter and Johnny Keyes, and I am sure that no-one else will have sung such a heartfelt version of this song. That’s How It Is is another slow and sad song. The track is about a relationship that is not working. It is about a man being used by the woman he loves. Sadly, this love is not reciprocated, yet he can’t help but love her. This is a great song, full of heartbreak and pain, and Otis Clay has reserved a fantastic vocal performance for this song. Quite simply, this is a great track. I Love You, I Need You, is another slow and sad song. The track has a glorious arrangement, one that is typical of the sound and quality that Willie Mitchell produce at Hi Records. This song is one that will tug at your heartstrings, make you feel Clay’s pain and heartache. On the track there is a fantastic organ solo from Charles Hodges, that helps, make this song the emotionally charged masterpiece that it is. The next track You Can’t Keep Running From My Love, sees Clay tackle another tale of love, this time one that is unrequited. This song is about a one-way love affair, where the suitor’s advances are spurned, and the suitor’s attempts to convince the lady in question of their suitability. Otis Clay sings the song well and the band and the Memphis Horns produce a stand-out performance, that add to, and compliment, Clay’s vocal performance. You Can’t Keep Running From My Love, is one of the highlights of the album. Precious, Precious is another track that OV Wright has covered, on his album Into Something (Can’t Shake Loose). By covering this track, Clay has set himself a tough task, as in my opinion, OV Wright sang the definitive version of this song. However, Clay has produced a good version of this song, albeit not as good as Wright’s version. Clay sings the song well, and has a voice that is suited to the song. Had I not heard Wright’s version of this song, I would probably be saying that this was a fantastic performance by Clay, but sadly, as good as this version is, Wright’s is better. Home Is Where the Heart is a song written Bettye Crutcher. Clay sings this song well, and it is an emotional and heartfelt song, that almost takes Clay back to his gospel roots. When one listens to the lyrics to this song, they have a spiritual feel to them. This track features some wonderful performances from the band, the Memphis Horns and the backing singers Rhodes, Chalmers and Rhodes. Like many other tracks on this album, this suits Clay’s voice. The final track on the album is Too Many Hands. It is a song about betrayal and hurt. Clay almost enters into a call and response with the Memphis Horns, who give a fantastic performance on this track. He sings the song well enough, but the song is not as strong as the rest of the album. This is a somewhat disappointing way to close this album. Trying To Live My Life Without You, is a good album from Otis Clay, and anyone who has not heard his music should consider buying this album. There are some great tracks on the album. In fact, out of the eleven songs on this album, the only weak track, is the final song Too Many Hands. The songs on Trying To Live My Life Without You have been chosen well, and feature a sterling cast of musicians and singers. On this album you will here stunning performances from The Memphis Horns, The Memphis Strings, backing singers Rhodes, Chalmers and Rhodes, as well as one of soul music’s greatest rhythm sections. Willie Mitchell has done a great job in producing this album. Clay should be thankful to Mitchell, as Mitchell was responsible for bringing out the best in Otis Clay, and it is a shame that Clay did not spend longer at Hi Records and produce more albums during his tenure there. However, we should be thankful that his time at Hi Records resulted in two quality albums, Trying To Live My Life Without You and I Can’t Take It. Should you wish to buy this album, it is available as part of a two-disc set which also features I Can’t Take It and the singles Clay released on Hi Records. This is a great introduction to the man and his music. I can thoroughly recommend buying this two -disc set, as it features some wonderful music, sung by one soul music’s greatest voices. Standout Tracks: Trying To Live My Life Without You, I Can’t Make It Alone, That’s How It Is and I Love You, I Need You. Thanks for your comments and thanks for pointing out my mistake. I’ll soon correct that. Keep reading my blog, there’s some great stuff coming real soon.